I have a lot of photos that are gunking up my Galaxy S5 device, especially since I took a trip abroad and took a lot of pictures. I want to delete them from my device ONLY, and still have them in Google Photos (or even Dropbox, as long as I can keep them somewhere). 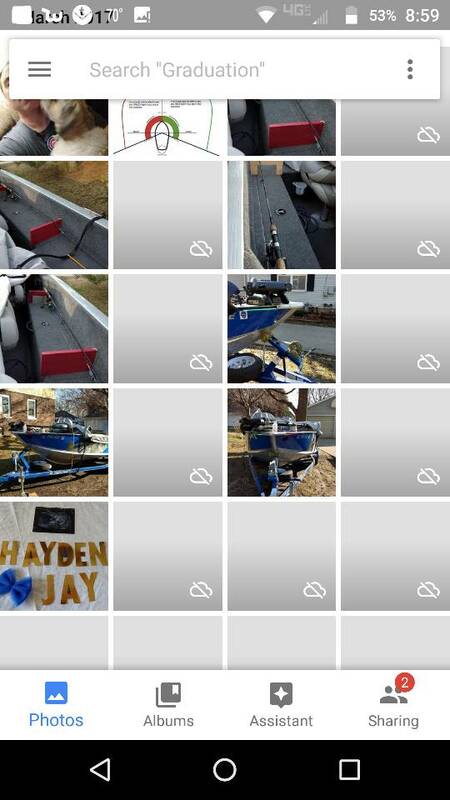 Google Photos is no help at all. I has no Remove from Device on the three-dot menu, and when I tap "Free up space," it says it can't, even when I've backed up the photos. I suspect that the advice that is on the Web is all outdated. Furthermore, I can't download another app because the device is almost full, DYK. They're probably on the SD card, correct? Google Photos doesn't really play nice with photos on external storage. In Google Photos, Hamburger Menu, Device folders and delete from there. To be safe, I'd double check that the photo still appears in the Photos tab (or on the web photos.google.com). And be careful when deleting stuff using Photos! You should get the warning, but deleting from the app through the normal method will delete all copies of the picture, including device copies and cloud backups! If you just want to delete from device, make sure the pictures are backed up and then use the Gallery app to do so. Yup. You don't want to be in the Photos tab when you're deleting photos. Have you tried deleting them through the file manager? Wouldn't deleting them through the Manager be the same as deleting them from the Gallery, and cause them to vanish from everywhere: Photos, Drive, maybe even Dropbox? 1. The photos are on my device, not my SD card. I need help because they're gunking up my device. 2. I understand that in the usual course of things, deleting photos from the device causes them to vanish from Photos and Drive. That's why I put the word ONLY, in all caps, in the thread title. 3. Google Photos is not cooperating. It says "Can't free up space" because the photos are not backed up, but it also says "Backup complete." Also, there's no "Remove from Device" on the three-dot menu. 4. I have the latest version of Photos. I managed to clear just enough space to update the apps I have. But it's an ongoing struggle. 1. From what I've seen: "Device" to Google Photos means both internal and external memory. 2. I made the incorrect assumption that they were on the SD card because I've personally experienced Google Photos only deleting device-internal photos when using the Free Up Space option, basically ignoring the device-external photos. Sorry for that. 3. You don't need the Google Photos app for this. Forget about the Free Up Space functionality. If you want to use the Google Photos app for this, make sure you're in the "Device Folders" section, not in the Photos view. Deleting from "Device Folders" within Google Photos doesn't remove cloud storage. 4. I recommend that you log in to your Google account on a desktop browser and view your gallery at photos.google.com. If they show up in the web view, they're safely backed up. Open the Samsung Gallery app (I believe there should be one on your phone, just don't use a Gallery app connected to your Google account) and cross reference the backed up photos in web view to the photos in the Samsung Gallery app. Delete a photo from the Samsung Gallery app. This should not affect your Google Photos cloud storage. Do a sanity check - delete from Samsung Gallery, refresh the web view and see if it's still there. Then start doing this deletion in bulk. Thanks. I'll try that when I get a chance. I had to do a factory reset a while ago and after all was backed up I noticed some photos showed up as blank with a cloud icon. Or even just a gray square. I had deleted some photos because there were duplicates after the reset. If I click on the photo it just acts like it is loading but never does. I just want to remove the gray squares from showing up if the pictures are no longer there. How can I answer to my iphone from aviation headset? How to remove the com.android.system.v5? How do I stop Messenger from sending messages on Messenger and also as a text and vice versa?